Chocolate cheesecake: you’ve never tried a dessert so delicious! This incredible cheesecake is very beautiful and tasty, you'll surprise everyone. Ingredients: 250 g light cookies; 150 g melted butter; 250 g cream cheese; 200 g sugar; 1 tsp vanilla extract; 900 ml heavy cream; 1 ½ tablespoons gelatin powder; 200 ml melted chocolate. 1)Crush cookies in food processor. 2)Add melted butter to the cookie crumbs and mix until well combined. 3)Pour crust mixture into a cake pan and chill in the refrigerator for at least 4 hours. 4)In a large bowl, whisk together cream cheese, sugar and vanilla extract. 5)In a pan heat the heavy cream until hot, then add the gelatin and let it rest for 1 minute. 6)Slowly whisk in the cream. 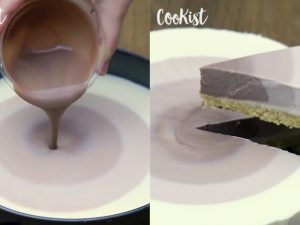 7)Divide the cheesecake into 4 bowls with 3 cups (700 ml) in one bowl, 2 cups (470 ml) in a second, 2½ cups (590 ml) in third and 1 cup (235 ml) in the fourth. 8)Now add 1 tbsp of melted chocolate in the second bowl, 3 tablespoons in third bowl and 2 tablespoons of chocolate in fourth. 9)Slowly pour the contents of the each bowl into the center of the pan, in numerical order. 10)Cover the top of the pan tightly with plastic wrap and chill for 4 hours or overnight in the fridge before serving. 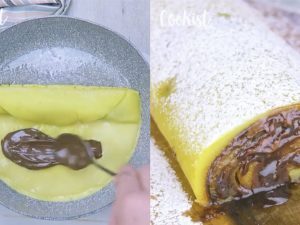 An original "egg pudding" : you’ve never seen anything like it!